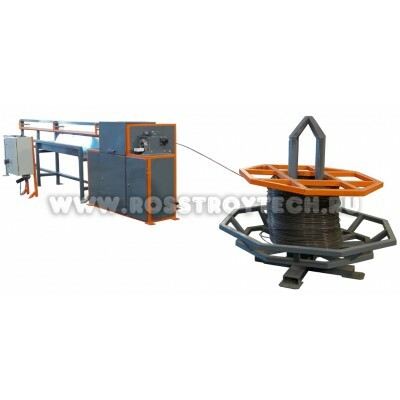 "Rosstroytech" provides complex equipment supplies of welding mesh machines, step welding of flat frames, spiral reinforcement cages, wire straightening equipment, reinforcing steel cutting machines, and prestressed reinforcements for reinforcing workshop. WF series multi spot welding machine is designed for heavy mesh wire production diameter from 4 to 12 mm. 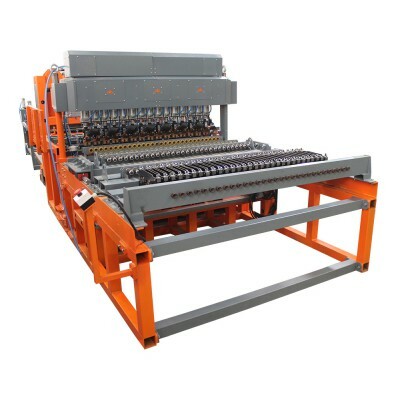 High efficiency of WF series machine allows to produce up to 29 tons per shift of reinforcing mesh in bulk. Basic features Welding unit of WFseries available in 2 versions: manual roller feed module equipped or automatic feeder of cross bars bunker. WF series have a re..
Anchoring machine is designed for prestressed concrete structures manufacturing, dead-end anchors formation by electric resistance welding technology. 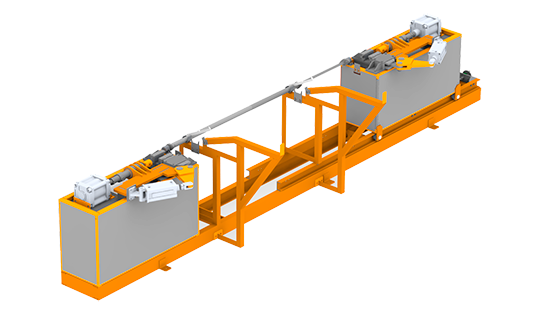 Table moving mechanism allows to operate the reinforcement different length. 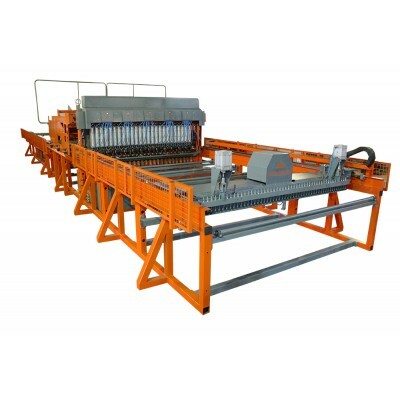 ..
Machine is designed for reinforcement tensioning by heating method, which used in prestressed concrete products manufacture as hollow core slabs, piles and pillars. .. 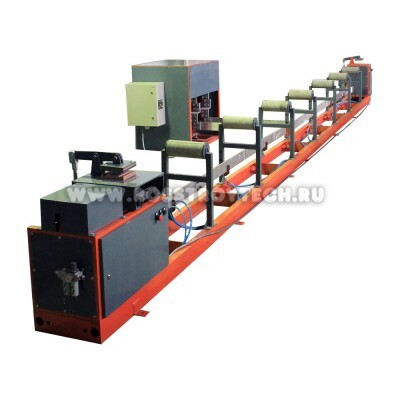 High-speed Automatic straightening and cutting machine with Automatic uncoiler included. 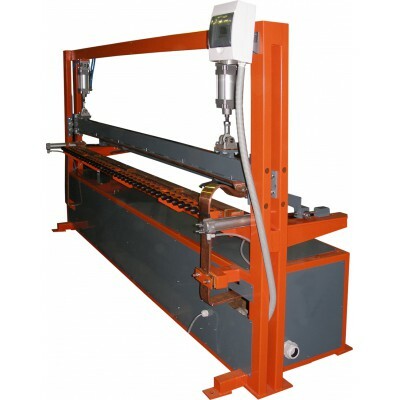 Automatic straightening and cutting machines cover a wide range of wire (steel drawn wires ranging from mild to high tensile and galvanized) diameters from 3 to 6 mm with speeds reaching 110m/min and more. Wire straightening is executed by processing coil wire through a rotating spinner with tungsten-cobalt di..
WFE welding assembling machine is equipped with movable heads with welding electrodes which are moved along the upper beam according to the program of weld mesh grid. 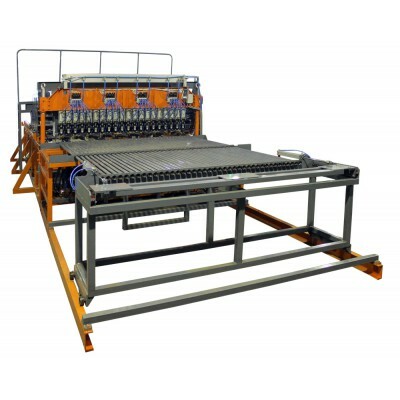 The machine is designed for solving tasks in precast panel construction: welding wire mesh with different cell sizes and openings combined with different diameter and length of rods of rebar. Working ..
Full automatic multi spot welding machine WL series has a line and cross wire coils, high-speed performance about 12.5 tons per shift. WL series machine is designed for mass regular mesh production, and oriented for large mesh manufacturers. WL series require more space for full production cycle in comparison with compact WP series. WL series require a feedstock for continuous ..
Semi-automatic multi spot welding machine WP series has a great performance, about 5 tons output per shift, and inspired competitive characteristics. WP series machines provide average production volumes of various diameters wire mesh, intended for own use and sale. How it works Operator sets up the desired technical parameters via control panel, and makes general adjustments of the machine ..
Manual welding machine RL series is designed for welded coil mesh production. RL series machine is low-cost and simple operating, compared to the automatic multi spot welding machines. 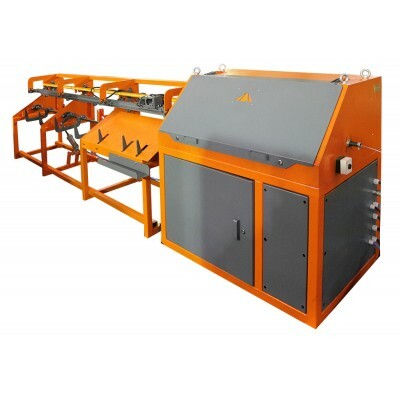 Using the manual welding line allows you quickly and efficiently to start the welded wire mesh production. Rosstroytech offers the machine welding the wire (bars) with diameter from 3 to 6 mm (and .. 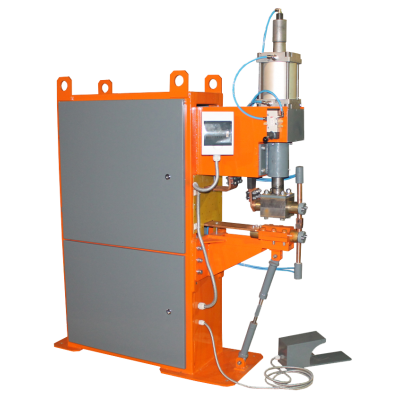 Step welding machine is designed for heavy flat cages production. Flat reinforcement cages used in various precast concrete products of the construction and concrete industry. 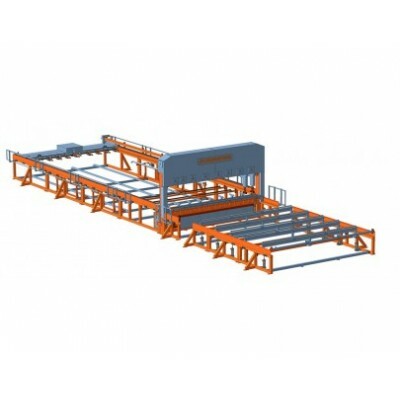 Reinforcement cages are irreplaceable in monolithic construction and various building projects which allows to cut expenses and minimize terms of delivery of objects in operation. In addition, step welding machine provide..
Manual welding machine RLT series for the rebar mesh production, wire diameter from 3 to 16 mm, cell dimensions from 25x25 to 300x300 mm. RLT series is the advanced modification of RL series. 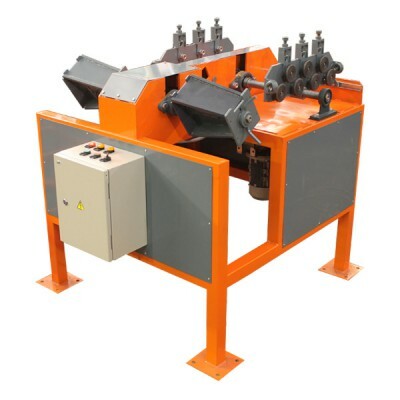 Features: Movable bottom busbar (reducing wear and tear); Powerful pneumatic cylinders (in a clip and line displacement mechanism); Powerful transformers. 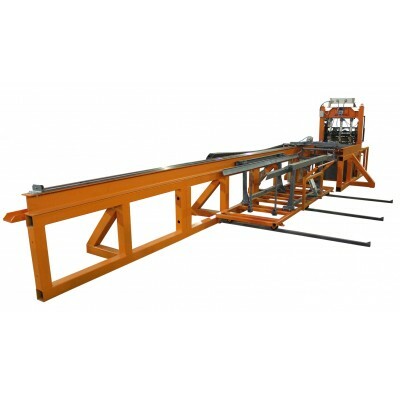 New system of guide ..
MTR series machines are designed for welding a wide range of wires and rebar, flat cages and frames. MTR series combines compac design, easy setup and flawless welding quality. 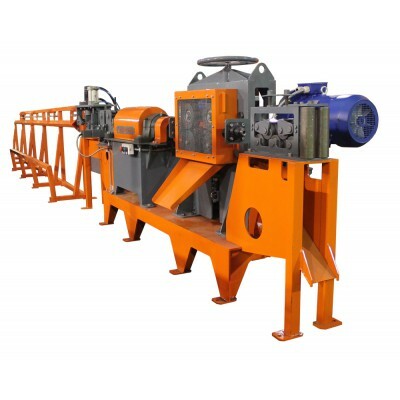 Basic features: Compact cooling system (closed circuit) of the transformer welding machine; Built-in noise reduction system; Adjustable stroke of the electrode; Schneider Electric, Camozzi comp..
Spiral winding machine double sided (2 spools square or trapezoidal, various diameters) is designed for frames assembly in manufacturing of prestressed concrete products, concrete piles and pillars. 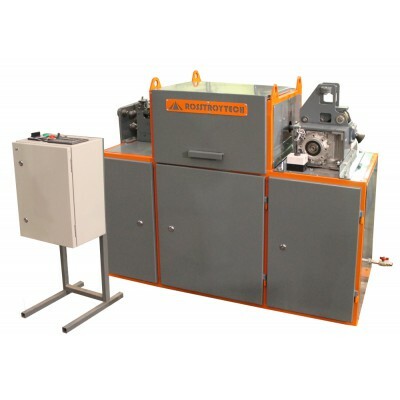 ..
Straightening and cutting machine automatically unwinds wire from the coil and cut the bars to size. 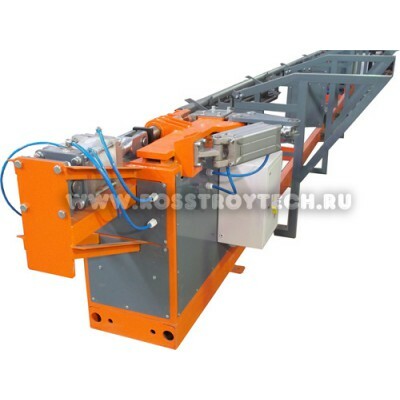 "Rosstroytech" straightening and cutting machine with roller-type rotor straightening technology and multiple cross-flexible bending the wire in spinnerets. Wire feeding unit is driven by rollers. 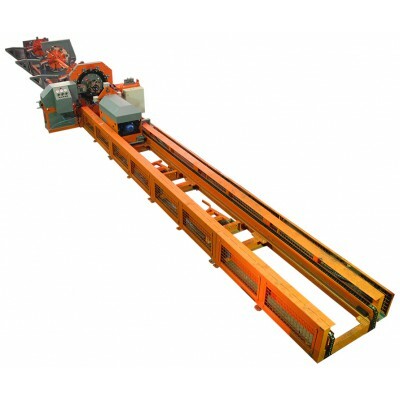 The "intelligent" length check provides automatic adjustments when changing the le..
Straightening and cutting machine automatically unwinds reinforcing steel from the coil and cut the bars to size. 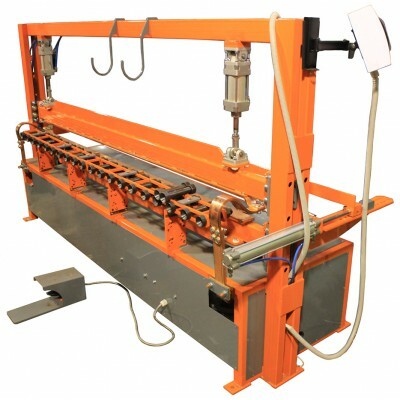 "Rosstroytech's" straightening and cutting machine with roller-type rotor straightening technology and multiple cross-flexible bending the reinforcing steel in spinnerets. Wire feeding unit is driven by rollers. 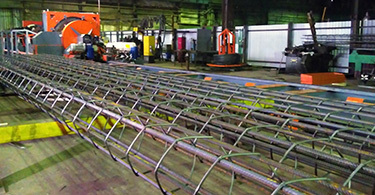 The "intelligent" length check provides ..
WS series pile cage welding machines are designed for reinforcement square pile and cage production. WS series technology is based on the winding of a continuous uncoiled wire spiral around the longitudinal rebars while the welding heads moves along the wire. WS series is a professional cage welding machinery, and has no analogues in Russia. WS series based on the latest technology and elect..